I stopped by Gleason Works (1000 University Ave.) for the Mayoral Debate tonight. On the ballot are Tom Richards as a Democrat, Alex White on the Green Party ticket, and former mayor Bill Johnson as an independent. Ann C. Lewis was in present as a write-in candidate (and handing out literature outside) along with a couple other write-in candidates who were more vocally upset at not being invited to the debate. I've known White a bit through a friend of mine, and I find him to be rational, methodical, strategic, and a real lover of living life. I don't think I've ever seen Richards, and I've only had passing contact with Johnson when he was mayor or around town on occasion. Anyway, let me lay things out in broad strokes. Rachel Barnhart, acting as moderator, asked 5 pre-conceived questions then selected several more from cards from the audience. Alas, she didn't ask about the proposed RGRTA Bus Barn project on Mortimer Street nor about the City Schools, but instead found it more important to ask about suburbanite concerns about parking and about what to do with the riverfront. In general, all the candidates recognize the major issues before them and have similar directions they'd like to go in. The differences, though, are what's key. All three candidates agreed that giant boondoggle projects failed to revitalize downtown — White cited a few, and Johnson added that he counted 27 in the past 60 years or so as part of his research as a college professor. However, only White wanted to move forward with caution. Johnson seemed almost bitter that the Renaissance Square was opposed and cancelled — he saw it as the first time in a long time that the city and county cooperated, but my perspective was less of a trophy of such an achievement and more that the county would defecate and the city would get to keep it. Richards cited value in a rivers-end marina being developed with high-priced housing adjacent; he apparently didn't hear that the real estate market's bubble burst. While Johnson and Richards play with hitting the proverbial lottery, White's "big project" was public transportation possibly using light rail — and at that, his proposal was for, at best, a modest start rather than a one-shot full system. White also differentiated himself by understanding that he is, foremost, a champion of the people. Johnson continues to give more credence to businesses than people (and yes, I fondly recall how he was so easily contacted, often recommending people call his office and set up a lunchtime appointment). Richards was scarcely a Republican in Democrat clothing showing strong support for big business and high finance over actual people. For instance, when White proposed that abandoned houses be rehabilitated for low-income families, both Richards and Johnson jumped down his throat that (1) the houses are not worth salvaging (clearly, White was proposing for the many houses in salvageable shape), and (2) the city now has a policy to secure the houses so it is nearly impossible for people to get into them so they can be "preserved" and get sold later. Missing from the discussion is that homeless people can be paired with abandoned homes (at least temporarily) to help solve two problems. White also proposed that Rochester attempt to supply municipal electricity, citing that the density of electrical service suits such a system and can drive utility bills down. He prefaced by acknowledging that Richards opposes the idea (purportedly because Richards was former CEO of RG&E, resigning profitably when it was sold to Energy East, then later Iberdrola headquartered in Spain). Richards countered by saying that municipal power wouldn't work because there is no reserve to tap from, adding that the utility company is a major taxpayer in the city whose revenues would need to be replaced. Obviously capacity consumed by RG&E customers would be freed up for municipal power, so his argument is essentially that it's better to spend $0.17/kwh (average what I pay) so that $0.02/kwh can go to the city and $0.10/kwh can go to profit (fictitious figures, but you get the idea) rather than paying $0.05/kwh for municipal power and making up the $0.02/kwh difference in additional property tax (for those not good at math, that's a savings of over 50% of the cost of electricity). Anyway, in reading other media, I find they fall for the allure of Johnson and Richards slickly polished public speaking skills with Johnson and Richards having an edge with better sound bytes. However, White spends less effort perfecting his public image and more developing sound choices for the future of Rochester. I found some time and stopped by The Kate Gleason Auditorium at The Rochester Public Library (115 South Ave.) for the presentation of a Center City Circulator Feasibility Study for Rochester by C&S Companies. They are surveying employees and full-time residents of the area inside the Inner Loop to determine if a circulator (a short, fixed transit route for moving people around a small area) is feasible. They presented the current survey results and asked for suggestions which they wrote on two large easels. Their results indicated that they were surveying people on how they presently commuted to downtown. The vast majority (some 80%) drove alone in a car and used a parking lot. They unfortunately included Kodak so the results skew strongly toward Kodak's behaviors. More importantly, though, they seemed genuinely mired in the car-plenty, cheap-fuel, 1960's thinking that inspired the city's infrastructure. For instance, I was met with surprise when I suggested they examine the possibility of removing automobiles from the area in the Inner Loop, serving it only through a circulator and foot-traffic, perhaps starting with a trial area. My thinking is that fuel costs and the costs associated with a car-culture are going to increase, and it would be wise to examine options that look past the status quo. It becomes a question of whether we want to be more like Denver or more like Palmyra. Most of the suggestions from others revolved around providing free parking (so I suspect C&S's presentation to the City will strongly endorse free parking). I thought it unprofessional to watch one of the camera crews recommend that the media should be able to park with impunity without being ticketed. I'm not surprised on either front. In the first case, if you ask people what they want, they will start from what they know; it will take leadership to create a better situation that is not simply more of the past. In the second case, I have been nothing but appalled at the lack of quality in television news, and this is just more of the same. I went for a run this morning and brought along my camera. 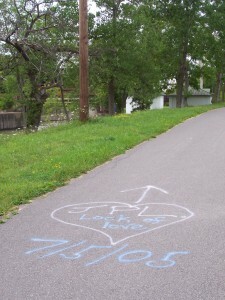 Along the canal path a recently painted note appeared on the trail. I always get a chuckle out of it: it says, "JPL Lock of Love" in a heart with an arrow pointing to the guard lock and the date 7/5/05. "Lock of Love" tag that appeared about two weeks ago. 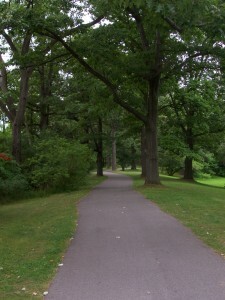 Then I get into Genesee Valley Park (Hawthorn Dr.). I've always appreciated Frederick Law Olmsted's designs for paths to be varied in an ornamental fashion without becoming inefficiently winding. For months now, I've noticed that nearly every car parking in the lot by Building 520 on The University of Rochester (Elmwood Ave. at Intercampus Dr.) is in a handicapped-accessible parking space. I commend the University for their progressive thinking to hire people of different abilities. Of course, things weren't always that way. 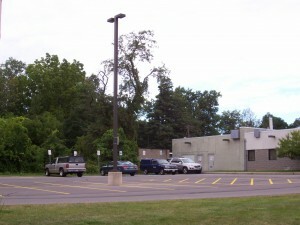 The University of Rochester Building 520 parking lot. I think it's funny how pervasive cultural norms are. 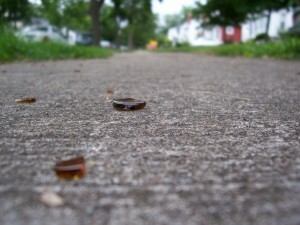 When I say I run barefoot on sidewalks and streets, about 90% of people say, "what about glass?" I seem to be gifted and have an instinct to not step on things. When I run, if I just look toward the ground in front of me, my brain automatically sets my footfalls so I don't step on things — all without thinking about it consciously at all. Of course, when I see glass, I make a deliberate effort to go around it: I'm not concerned that I'll cut myself badly stepping on a big piece, the nearby tiny shards that get stuck in my foot are more likely and terribly irritating. Broken glass in front of 185 Elmerston.